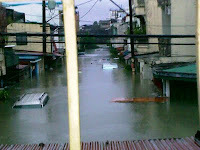 Yes, my long absence here meant we were hit by typhoon Ondoy. Our personal belongings were damaged true, but we are more than thankful that our families and friends are safe. Things are slowly getting back to normal for us. Although we've got no car and TV for almost 3 weeks already, I see this little inconveniences as nothing compared to those who need to be in evacuation centers. As for my daughter Reese, she found comfort discovering new vidoes to watch from the internet like "Your Baby Can Read" and the old "Mickey Mouse and friends" cartoons. All along, we've been waiting for the owner of the place we're renting to sell it to us not knowing that Ondoy could cause it to drown. Surely, we've lost almost all of our property options right now and all we can do is to ask God to open new windows for us to find the place that we can really call OUR HOME.